I’m not going to make you read to the end to see who the winner is. Those of you who want to read this full post will, and those of you who just want to know the winner will just scroll to the end anyways haha. I used Excel randbetween to generate a random number and that number was 5. So the winner of the CSN $40 giveaway is Lisa. Lisa said, “That looks like quite a spread! I’m glad you got the chance to celebrate your dad’s birthday. I would get a kitchen appliance, such as a hand blender.” Congrats Lisa, I have already emailed you. Please reply back within 72 hours so I can confirm that I have the right email, and give you the rest of the details. That was fun! Thank you to everyone who entered this giveaway, and thank you CSN Stores for this opportunity. On with my post. When you get back from Paris (lucky ducky) and do have time to read this, this one’s for you Valerie! As you may recall, after having the “bo la lop” (ground beef shishkebabs wrapped in la lop/betel leaves) at Pagolac restaurant, we went unsuccessfully searching for la lop leaves at Lucky 97. Well, I saw them at T&T the other day and thought of you. My Mom also told me they have them at Lucky, but guess we missed them. 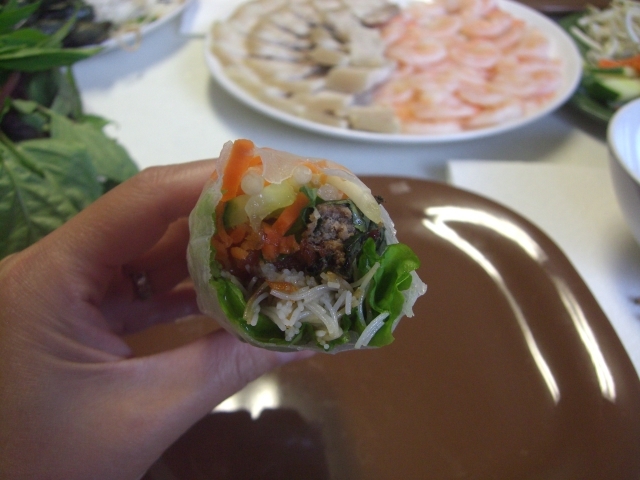 Just last week we had Vietnamese wraps at my brother’s house and I knew I had to post this for you. Here’s our recipe for beef la lop shishkebabs (without exact measurements as it depends on how much you want to make). 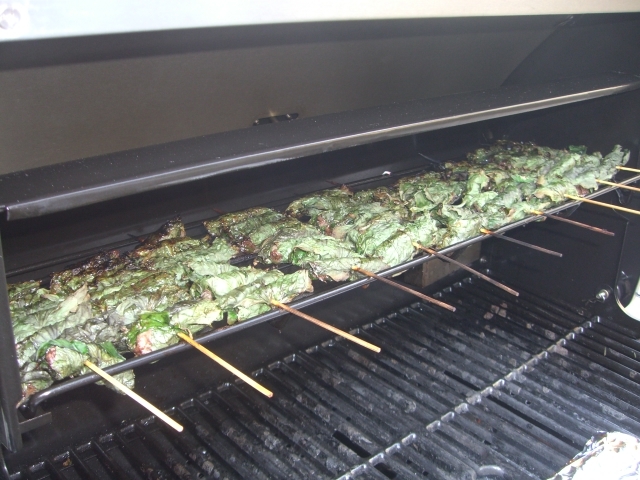 Note: Prior to barbecuing, soak the skewer sticks in water for about an hour. 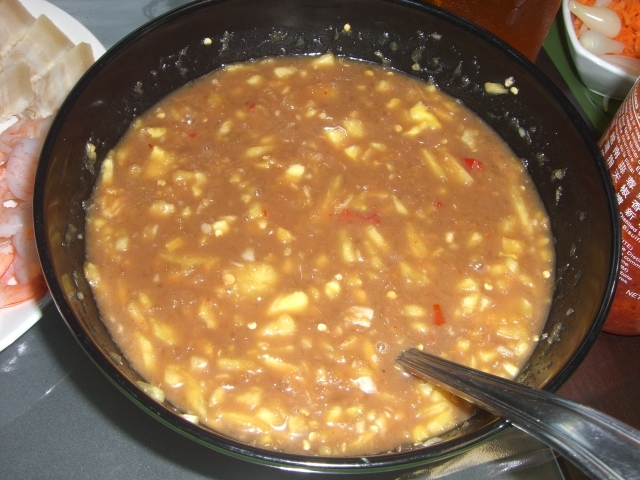 In a big bowl, mix everything together. Form into about 2 inch logs. 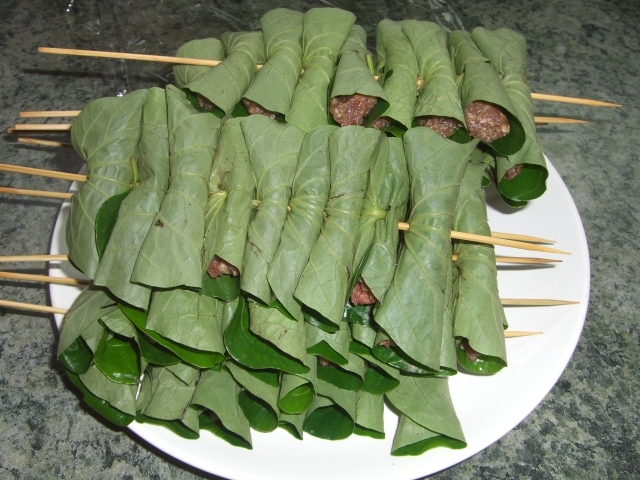 Wrap each roll with a la lop leaf. Skewer 5-8 logs onto a skewer and place on barbecue. To be honest, this is just a mediocre recipe. If you want a better one, Tanantha at I Just Love My Apron has a pretty great one up here. 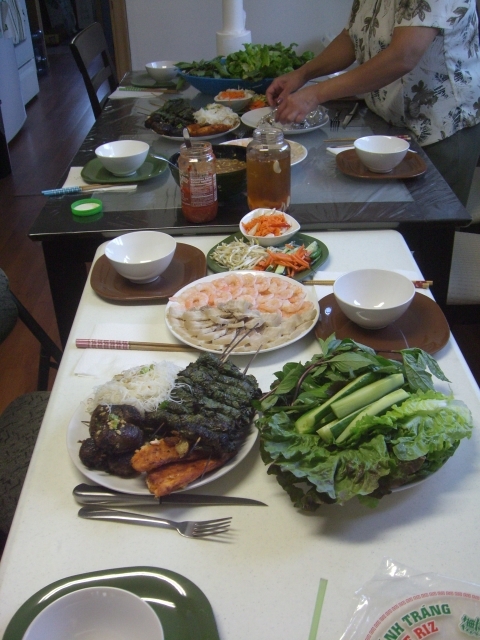 Except she used pork rather than beef, and basil leaves rather than la lop leaves. She also has actual measurements. 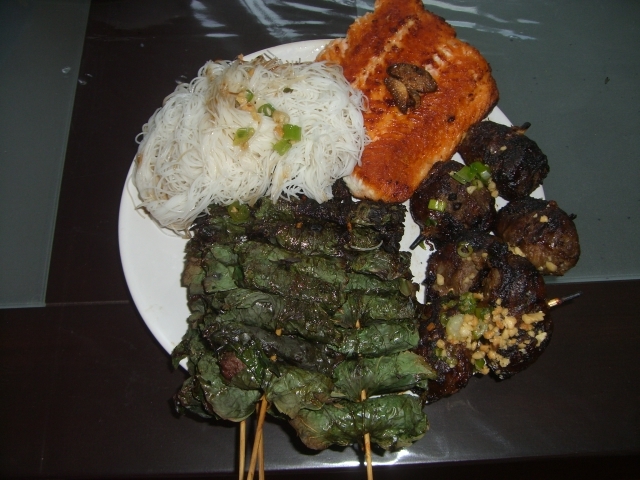 pan fried salmon, rice vermicelli, beef la lop shishkebabs, and another ground up beef ball shishkebab that’s wrapped in a layer (more like a web actually) of pig fat. Nope, I don’t go near that one either. 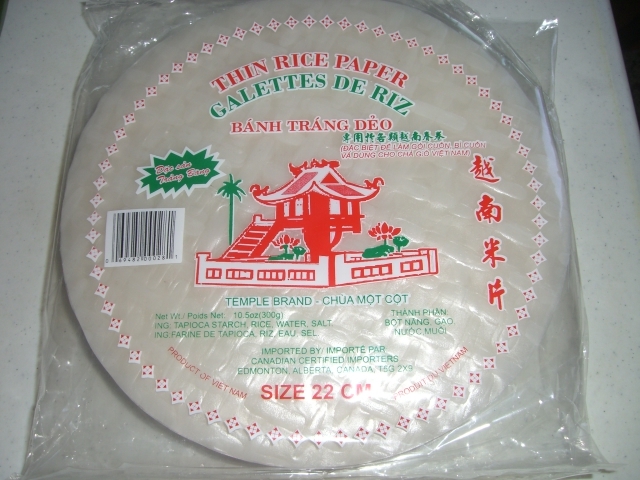 You’ll also need rice paper. These are the two brands my parents had. I like the brand with a rose on the front or three elephants. 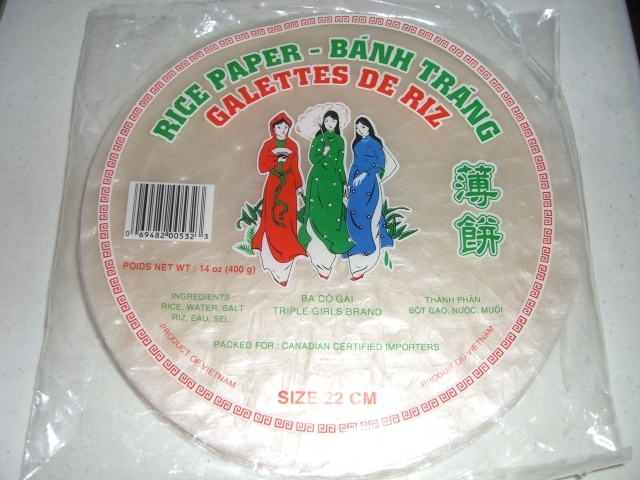 You’ll need a big bowl of warm (make sure it’s not too hot) water to quickly wet your rice paper in. 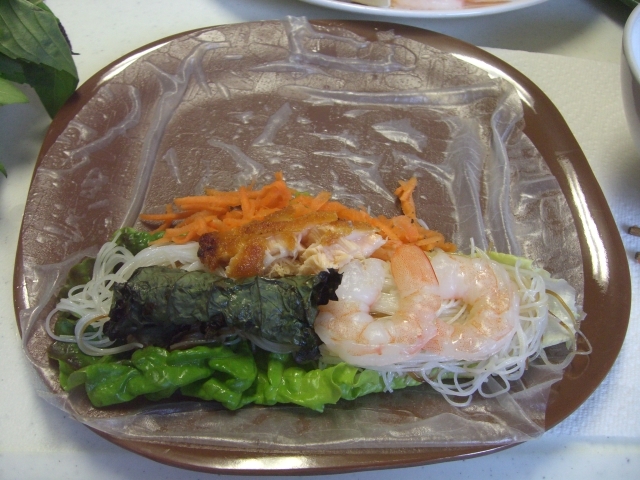 If the water is too hot, it’s hard to wet your rice paper as it gets limp very quickly. We also use a lot of veggies with our wraps, such as lettuce, Thai basil, mint, bean sprouts, cucumbers, and shredded carrots. 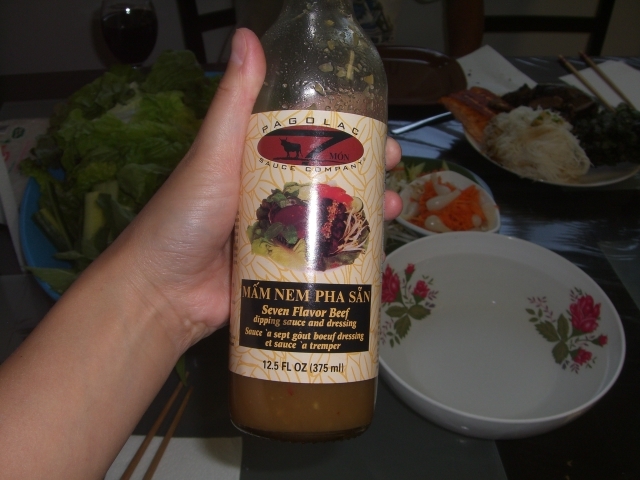 This is the sauce my family likes ,but it’s too stinky for me lol. Tanantha, another stinky goodness that you enjoy? 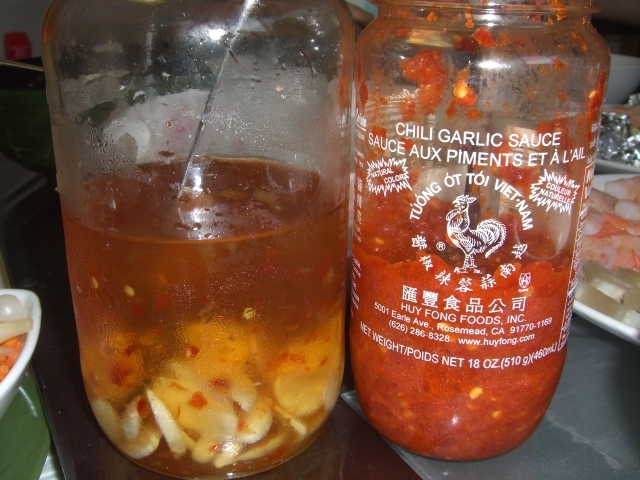 My sister in-law mixed that sauce with fresh chopped up pineapple, lime juice, and chili garlic sauce (which you see in the bottom picture). I like to use the fish sauce (left jar) which you use with deep fried spring rolls (also stinky but not as much as the sauce up top). 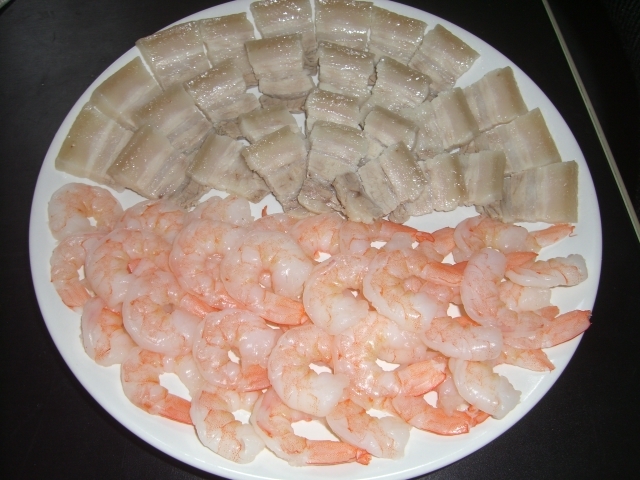 I’d have to say, there are a lot of stinky, but good Asian foods…teehee. Table is all set to eat. 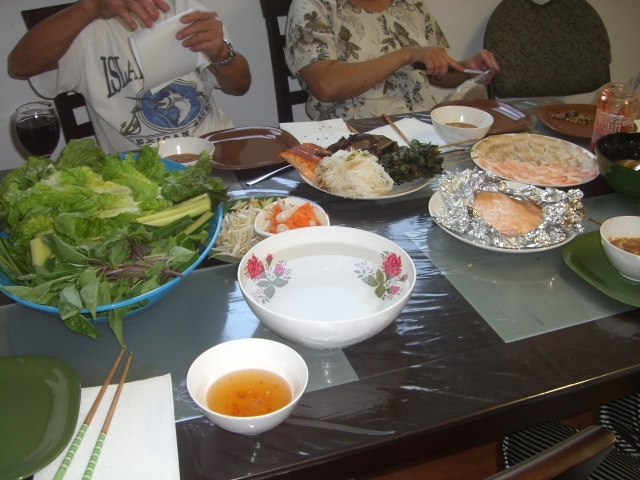 My family uses chopsticks when they eat this (other than the wrapping part of course), but not me. I’m a savage, I eat with my hands, and I think it tastes better that way anyways. So here’s what you want to do after you’ve quickly wet the rice paper in warm water. 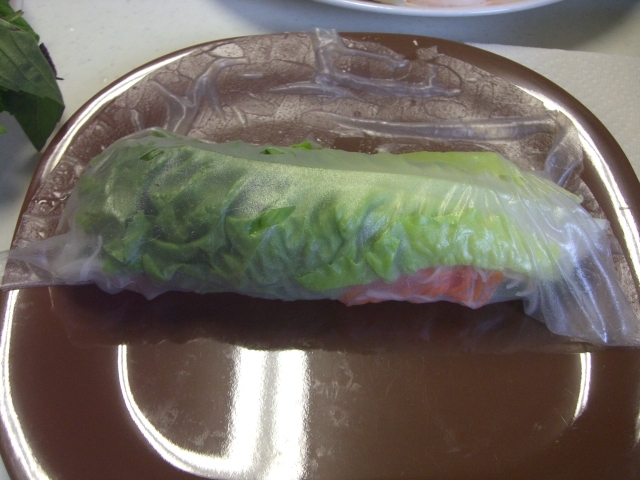 Start with a piece of lettuce and stack everything on top in case your rice paper breaks/rips, you still have your lettuce holding things together. 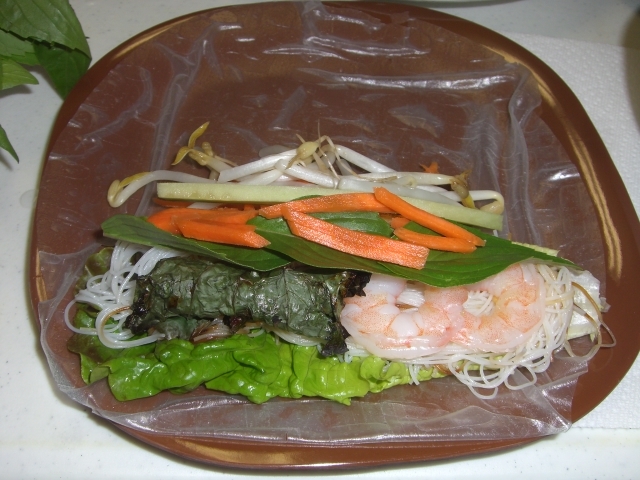 Fill your wrap with some vermicelli, and meat. Then top off with some veggies. You can also put another piece of lettuce on top to encase the whole roll. I don’t, as it gets too bulky. 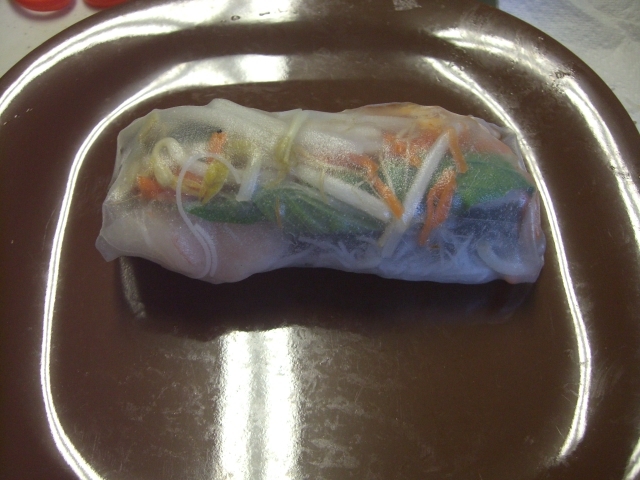 Roll the wrap about half way, just enough so that you can tuck the rice paper underneath to secure it. Fold both ends up and then finish rolling. Dip in your choice of sauce and om nom nom….yummy! 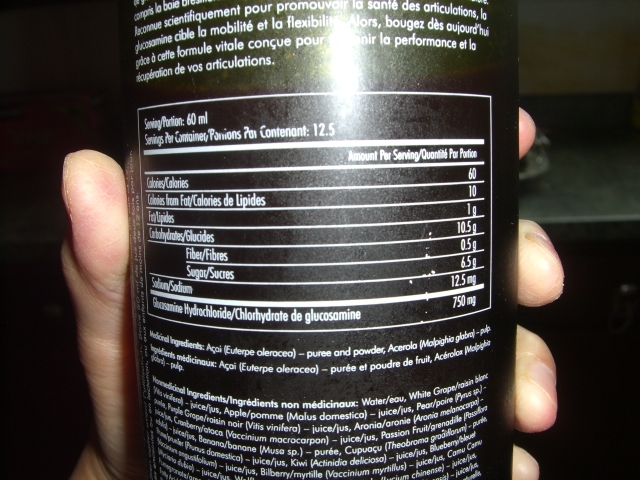 Another thing I want to talk about today is MonaVie. MonaVie is a health drink packed with 19 health-promoting fruits, including the acai berry. Don’t worry, I’m not trying to sell you anything. I just want to monitor and track my progress on my blog after taking this drink. A while back I injured my back. It wasn’t just a one day thing, I believe it was from constantly carrying L around and partly a sports injury. I used to play tons of sports, everything from badminton, to volleyball, basketball, floor hockey, table tennis, flag football, soccer, tennis, etc. Yup, you name it, I played it. Ever since my back injury though, I haven’t even been able to carry L without pain, let alone exercise. I’ve tried acupuncture and physiotherapy. Neither of them helped and I’ve heard great results from people who have tried MonaVie. So I’m going to give this a try to see how it goes. 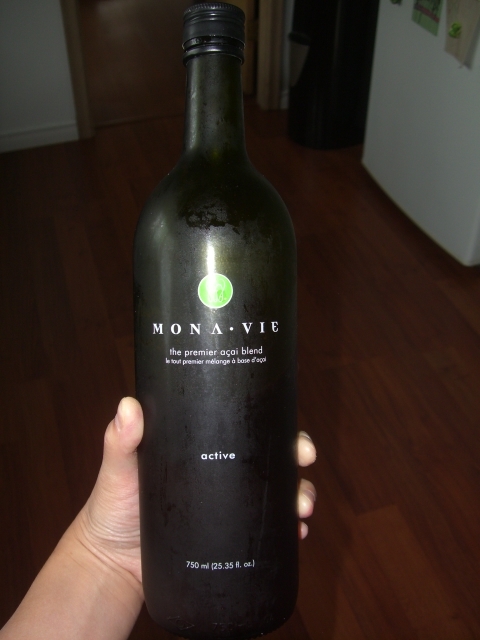 I’m trying out the MonaVie Active, which is supposed to help joint health. If it works, I’d also like the hubby to try MonaVie Pulse, which helps maintain cholesterol levels. If anyone has heard of this product and have any comments about it (good or bad), I’d love to hear. That’s it for this week folks. Until next time friends and family.